MILAN: Teenager Moise Kean scored his sixth goal in as many league games but champions Juventus slumped to a shock 2-1 defeat at lowly SPAL yesterday to put their Serie A title celebrations on hold. Massimiliano Allegri’s side had needed just a point to claim a 35th Scudetto with a record six games to spare and Napoli a distant second. Kean opened the scoring for the seven-time reigning champions when the 19-year-old stuck his foot out to direct a Joao Cancelo effort home after half an hour in Ferrara. 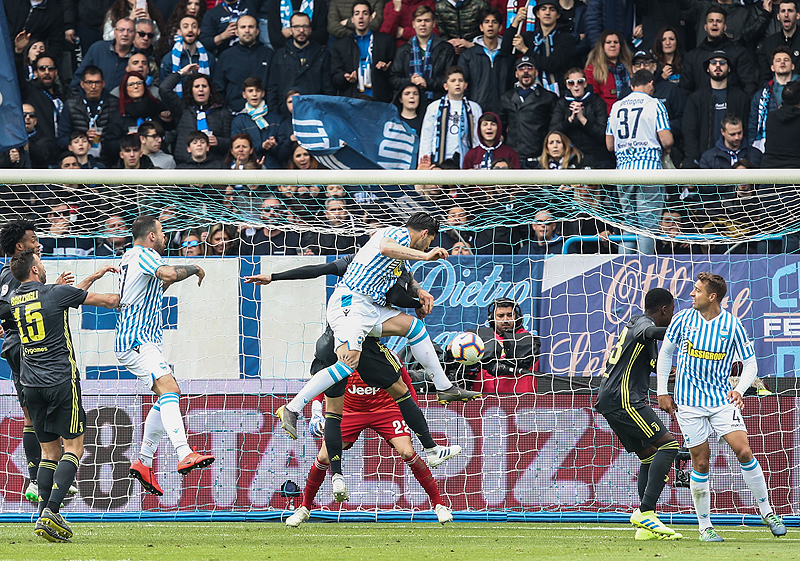 But Kevin Bonifazi (49) and Sergio Floccari (74) responded with precious goals which eased SPAL’s fight for top-flight football next season. “Making records is very difficult, it takes energy and there is also Europe to concentrate on,” said Allegri, who rested key players including Cristiano Ronaldo ahead of next week’s Champions League decider against Ajax in Turin. “If we had put all our regulars in it would have been easier to win it, but there is also the goal to obtain on Tuesday.” Juventus have a 20-point advantage on Napoli and can still seal the title in record time today if Carlo Ancelotti’s side fail to win at bottom club Chievo. Otherwise, they could win their eighth consecutive Scudetto next Saturday at home against Fiorentina. Then they would match the previous best of winning the title with five games to spare achieved by Torino in 1947-1948, Fiorentina in 1955-1956 and Roberto Mancini’s Inter Milan in 2006-2007. Allegri experimented with an eye towards the quarter-final, second leg game against Ajax after a 1-1 draw in Amsterdam. Ronaldo was rested after returning from injury to score in the first leg against Ajax, with forwards Federico Bernardeschi and Mario Mandzukic also starting on the bench. Mattia Perin replaced Wojciech Szczesny in the Juventus goal with Kean getting his second start alongside Paulo Dybala up front. Cuadrado and Andrea Barzagli returned from lengthy injury lay-offs with young defender Paolo Gozzi, 17, and midfielder Grigoris Kastanos, 21, handed debuts. “We paid a little for our inexperience,” said Allegri. “We played with a lot of youngsters. I regret this defeat because I think the match deserved more a draw than a loss.” “I needed to see the conditions of Juan Cuadrado, who is unfortunately off the Champions League squad list, and also Dybala, whose fitness levels weren’t at their best,” he added. In Madrid, Barcelona held back for Manchester United by resting every outfield player possible on Saturday, including Lionel Messi, as La Liga’s runaway leaders were held to a goalless draw by Huesca. Goalkeeper Marc-Andre ter Stegen was the only one to keep his place at El Alcoraz as coach Ernesto Valverde made clear his focus is on sealing progress to the Champions League semi-finals after the 1-0 first-leg win at Old Trafford in midweek. Messi was left out of the squad completely while the suspended Gerard Pique posted a picture on social media of him watching the game on television, with a bowl of paella on his lap. The draw gives Atletico Madrid the chance to reduce the gap at the top of the table to nine points if they can beat Celta Vigo at home later on Saturday but, with six games left after this weekend, the difference is likely to prove irrelevant. For Huesca, who are bottom of the table in their first-ever season in Spain’s top flight, a hard-earned point means they sit five adrift of safety, albeit having played a game more than those immediately above them. Their survival bid remains unlikely but alive. Malcom came closest to a winner, his shot hitting the post, but Huesca were good value for the draw and could even have snatched victory themselves in the second half. Barca’s huge advantage at the top of La Liga has afforded them the luxury now of prioritising success in Europe, the only issue perhaps for Valverde the small matter of maintaining momentum. Overall, they were better than Huesca but never really got out of second gear. Like Pique, Luis Suarez was also banned while Ivan Rakitic, Sergio Busquets and Clement Lenglet were among those rested. Ousmane Dembele came in after recovering from a hamstring injury and, after playing 67 minutes, his chance of a start next week would appear enhanced.